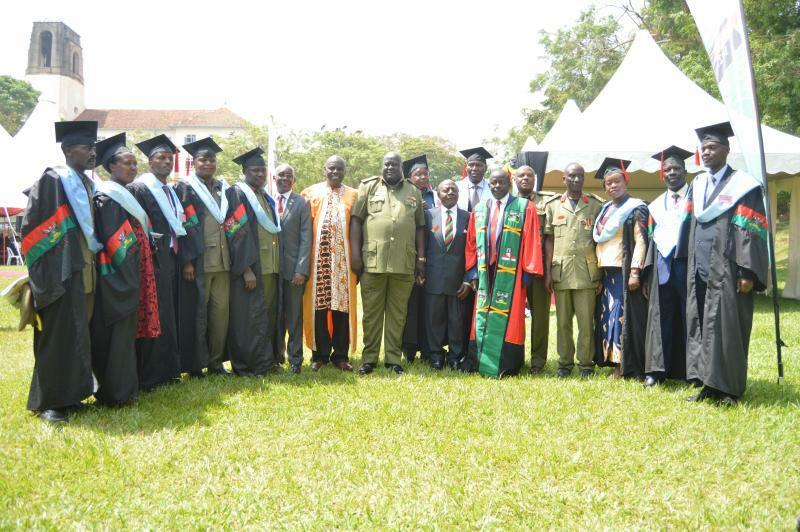 KAMPALA – The pioneer students of the Master of Arts in Defence and Security Studies graduated Friday, January 18. They are among the 13, 350 students that were awarded degrees and diplomas of Makerere University during the 69th graduation ceremony. Master of Arts in Defence and Security Studies Programme at the Senior Command and Staff College, KIMAKA. Course units taught under the programme include, the theory and practice of military intelligence; global politics; command, leadership and management; training doctrine in defense forces; theory and practice of modern warfare; joint war planning; issues in African international studies; and research methodology in defense and security studies. Other notable officials who have graduated today are Justice Steven Kavuma (Masters of Arts in International Relations and Diplomatic Studies) and Polly Namaye (Master of Arts in Journalism and Communication). During the graduation ceremony, the Vice Chancellor, Prof. Barnabas Nawangwe congratulated the graduands and cautioned them against acts of indiscipline. “The opportunities out there are immense, but only the disciplined will find them,” he said. He thanked all stakeholders, particularly the Government of Uganda and development partners for the support rendered to Makerere University over the year. He specifically thanked President Yoweri Museveni and the First Lady and Minister of Education and Sports, Janet Museveni for the unwavering support to Makerere to consolidate her position as a modern twenty-first-century university. One of the CHUSS PhD Graduates, Ms Rwamo Alice expressed gratitude to the Government for considering the allocation of competitive research funds to Makerere University in the next Financial Year. “With this support, Makerere University is set to increase her research output and impact on our socio-economic development,” he noted. The Chancellor, Prof. Ezra Suruma warned staff and students against actions that compromise the moral integrity of the University. “It is simply unacceptable to compromise on the moral integrity of the university. When that happens everyone suffers. We begin to doubt the value of every degree coming from Makerere University. Those who have worked hard to earn their marks become victims of those who have cheated. Anyone who participates in any way in falsifying the academic records of the university is an enemy and must be treated as such. I urge everyone, students, parents, faculty, alumni, government, media and the public at large to fight all forms of fraud, falsification and immorality in the university,” he said.